Staff from a West Yorkshire children's home are praising the impact Deaf awareness training has had on them being able to communicate with young Deaf people who live there. The training was commissioned by Kirklees Council for staff working at the Elm Grove Children's Home in Heckmondwike. Staff are now part way through the 64 hour in-house British Sign Language (BSL) Signature Level 1 course, which is being delivered by award winning workplace training and consultancy company, HearFirst. Staff at the home had limited signing experience having supported only one other deaf young person some time ago. They were keen to learn new skills and develop both their signing ability and deaf awareness generally. This home has obtained 'Outstanding' status from Ofsted for consecutive inspections over the last six years. The home's manager, Claire Morgan stated: "The eagerness and enthusiasm of the staff in wanting to develop new skills and knowledge has always been a strength at this home. Staff have high aspirations for the children and always go the extra mile to ensure they meet the needs of all children and young people in their care. We expect the best." Kelly Smith, Deputy Manager at Elm Grove, said: "Right from the start, by attending the BSL Level 1 sessions with HearFirst, our communication with Rachel was completely different. She was very excited, it helped to extend her vocabulary and we noticed that her behaviour and general wellbeing improved." The course is being facilitated by HearFirst tutor, Kate Brierley, who is a born Deaf BSL user and like all other courses delivered by the company, the purpose of this is to add relevance and depth to the training. Kelly continued, "The fact that the course is delivered by a profoundly Deaf person allows us not only to learn the language but to learn and understand the culture too. This helps all the staff understand that some of the signs and certain behavioural patterns shown by Rachel are in fact, quite normal for a Deaf child and it allows us to see the environment from her perspective. "After a few training sessions and understanding the signs, we found that it was the little things that made a big difference to her life and she started asking us questions." Julie Ryder, Director and Founder of HearFirst said: "Staff at Elm Grove are really embracing the sessions and enjoying learning the signs and developing their knowledge about deafness. They have seen at first-hand the benefits the training has had by helping them to communicate with Rachel. Similarly, the training has benefited Rachel as it helped her to progress her signing and give her more confidence in communicating with the staff. "There are over 45,000 deaf children living in the UK* and by working with children's homes such as Elm Grove, it helps us to raise awareness of deafness and the basic knowledge of how to communicate with a deaf person and in particular, to children. 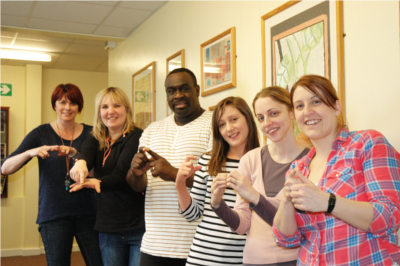 By introducing the staff to basic BSL signs, it helped us to achieve this." Young people live at Elm Grove because they are unable to stay at home with their family, for lots of different reasons. Some young people live there while they are getting ready to move into a foster family and others may live there for a year or two while preparing to live on their own.